The Timberfix 360 Premium Wood Screws - Zinc & Yellow Passivated is the all round performer: A combination of a cutpoint, performance countersunk head and the ground serrations gives a fantastically priced performance screw. For universal use in Timber, Chipboard, MDF, Plastics and Glass Fibre. 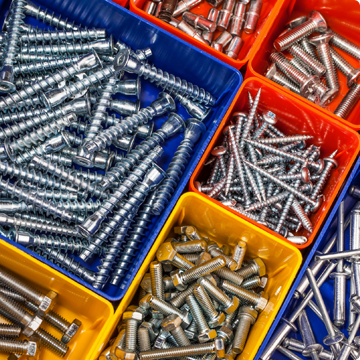 The screws feature a countersunk head with cutting ribs and crew head ribs to help reduce the thread being stripped when fixing hinges. It also has a deeper recess in screw head for stronger bit hold. The type 17 Gash Point Tip takes immediate hold so no pre drilling is required, even in Hardwood. Splitting is also prevented even when working close to the edge. It has a hard synthetic coating for easy driving.